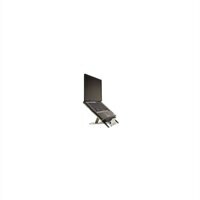 Goldtouch Go Travel Laptop Stand-BlackGet a more comfortable work environment with the Goldtouch Go! Travel Laptop Stand from KeyOvation. This laptop stand elevates laptop screen for improved head and shoulder posture for your convenience. It features six height adjust positions for you to easily achieve a comfortable, ergonomically appropriate position. The Goldtouch Go has angle adjusts for neutral positioning of hands and wrists and can be used as a document holder when attached to a standard keyboard. With aluminum construction, this Travel Laptop stand is a lightweight yet durable one. With all these features and more, Goldtouch Go! Travel Laptop stand is the one you should surely go for. Can accommodate notebooks up to 17"
Get a more comfortable work environment with the Goldtouch Go! Travel Laptop Stand from KeyOvation. This laptop stand elevates laptop screen for improved head and shoulder posture for your convenience. It features six height adjust positions for you to easily achieve a comfortable, ergonomically appropriate position. The Goldtouch Go has angle adjusts for neutral positioning of hands and wrists and can be used as a document holder when attached to a standard keyboard. With aluminum construction, this Travel Laptop stand is a lightweight yet durable one. With all these features and more, Goldtouch Go! Travel Laptop stand is the one you should surely go for.